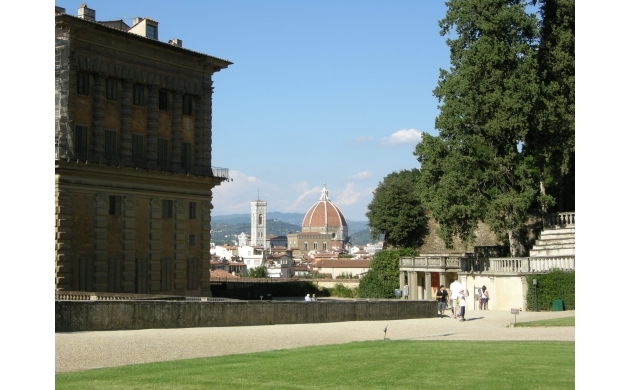 For over 400 years the famous Boboli Gardens of Florence have hosted the Medici family, residents of the Palazzo Pitti, and successively the Italian royal families of Lorena and Savoy. Noted for its model of an "Italian garden", the nucleus of which was constructed by the Medici family during the Renaissance period, small pieces were then added upon in successive years, each in a style of its own. Inside the Boboli, one finds numerous little lanes adorned with statues, fountains, grottoes and (obviously) multiple small gardens that cover an area of 45,000 square meters in which it is a pleasure to lose oneself. The gardens "climb" up the Boboli hill and are bounded by a triangular area closed in between the Palazzo Pitti, the Forte di Belvedere and the Porta Romana. Inside of the Boboli Gardens it is quite easy to lose oneself amongst the theaters, cafes, fountains, and little streets. So how does one orient oneself to be sure to see the most important things without the risk of missing out? Let's begin at the beginning: above all it's possible to access the Boboli Gardens from at least three entrances: from Palazzo Pitti, from the Forte Belvedere and from the Porta Romana. The entrance from both Palazzo Pitti and the Forte Belvedere cost 7 euros, while the entrance from Porta Romana costs 10 euros. 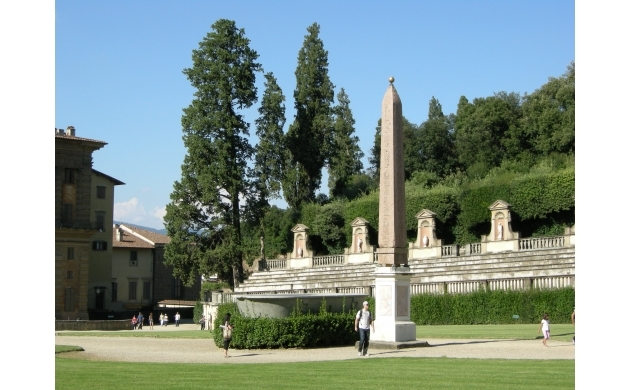 With a ticket it is possible to access the Boboli Gardens, the Museo degli Argenti, the Museo delle Porcellane, the Galleria del Costume, and the Bardini Garden. But it is also possible to buy a comprehensive ticket that is valid for three days and that allows you to also visit all of the museums of the Palazzo Pitti. The entrance to the gardens opens at 8:15 in the morning and the closing times vary according to the season (between 4:30 PM in the winter and 7:30 PM in the summer). But most of these times don't matter much, because what really counts is to be at a specific point in the center of the Gardens at precisely 3:30 PM (and soon you'll discover exactly why). Entering through Palazzo Pitti (the main entrance), the very first thing we find is the Fountain of Bacchus, with the view of the Belvedere Fort (Forte di Belvedere) standing off in the distance. 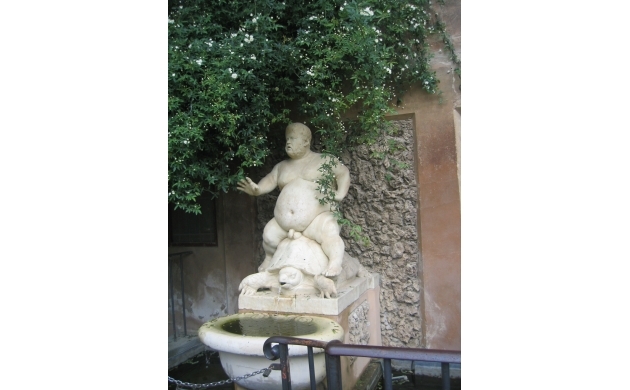 The fountain was built in 1560 and depicts Nano Morgante (the court dwarf of the Medicis), dressed as the god Bacchus while riding a tortoise, which is the symbol of the Medici family. It is here in this area, at the boundary wall, where we find the exit for the Vasari Corridor. Continuing straight forward past the fountain of Bacchus we find the Grotta di Buontalenti - a complex of sculptures and paintings on the inside of which we find the grottoes. 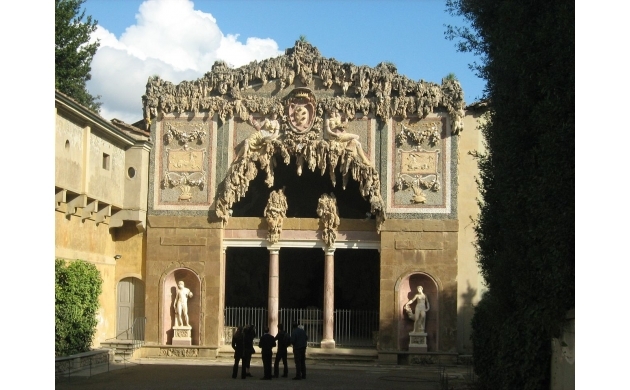 The Grotta di Buontalenti is certainly the most famous work within the Boboli Gardens. This artificial cave was built at the end of the 16th century by Buontalenti and Pietro Mati. The materials that were used included rocks, stalactites, stalagmites, sponges and shells. These were all put together to create a rich ornamentation of pastoral and animal figures. The unspoken theme of the grotto is alchemy: the art of transforming inorganic material into harmonic figures of men and animals. On the inside of the first room of the cave, at the four corners, you find the famous four uncompleted statues of Michelangelo, called Prigioni. And again the Venus who is exiting the bath of Giambologna. In order to enter the Buontalenti cave one must wait until precisely 3:30PM, when the cave opens to the public for only 5 minutes. At this point of your journey the only thing that separates you from the Belvedere Fort is the Kaffehaus: an unmistakable pastel green structure topped by a windowed dome. A request of the Lorena family in 1775, the Kaffehaus is built in a rococo style where inside is served coffee and chocolate. It is also possible to climb to the top of the Kaffehaus and have a view of entire expanse of the Boboli Gardens. Like the Grotta di Buontalenti, the amphitheater is also an artificially built structure within the Boboli hill. It is from this area of the gardens where the pietraforte stones used to build the Palazzo Pitti itself where taken - the resulting space thus giving form to the original amphitheater. Today it is possible to admire the ample piazzale surrounded by its six levels of stepped seating and topped with terra-cotta vases and statuary. But the defining feature of this amphitheater is without a doubt the granite basin at the center of which is placed an Egyptian obelisk dating to 1500 BC. 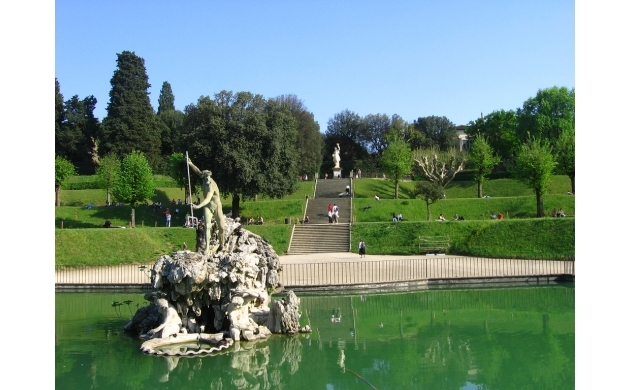 Above the amphitheater, towards the summit of the hill, you find the Fountain of Neptune. To reach it you must go up a double ramp decorated with three statues from the Roman era. It is from this point where the water used to irrigate the entire gardens is drawn. This is also the end of the high part of the gardens, marked by the defensive walls that extend from the Belvedere Fort and which become ultimately hidden behind numerous trees and hedges. The Fountain of Neptune is the work of Stoldo Lorenzi and depicts the god of the sea clenching his trident, giving rise to the name given by the Florentine people to the fountain of "del Forcone" meaning 'of the big fork'. It was given as a way of poking fun at the similarity between the divine trident and the regular all-to-human piece of cutlery. Arriving here we are at the newest part of the Boboli Gardens, built during the rule of Cosimo II in 1600 and tripling the size of the gardens by extending them all the way to the Porta Romana. The Viottolone (Grand Boulevard) is a long sloping road lined with laurels, cypresses, and many other types of trees above. On the right hand side of the road, looking downwards, it is possible to catch a glimpse of the small gardens in which are cultivated many rare plants. Meanwhile, continuing straight forward one eventually arrives at the fountain of the Ocean by Giambologna. We find ourselves in a large square, ringed with oak trees soaring more than 10 meters and with marble statues that surround the protagonist of the piazza: the large pool with an island in the middle which, in turn, hosts at its center the Fountain of the Ocean. Two small bridges connect the island to the mainland and permit one to see this magnificent fountain built by Giambologna. The fountain is surrounded by three sculptures that depict the Nile, the Ganges, and the Euphrates - the three rivers that pour their waters into the big basin that represents the Ocean. The final attraction, truly unmissable, is the statue of Perseus emerging from the water within the fountain itself. You can't help but admire this last work of the Boboli Gardens before making your way to end of the gardens, right at the Porta Romana.